Davos 2019 is upon us. Around 3,000 participants from business, government, civil society, arts, culture and media are gathering in the Swiss mountain town of Davos for five days of sessions on some of the most pressing global challenges. So, what are they going to talk about? The theme of this year's meeting is Globalization 4.0: Shaping a Global Architecture in the Age of the Fourth Industrial Revolution. In short, how do we make globalization work for everyone, not just the few? This, and related issues such as tackling climate change, fixing our broken economic system and preparing ourselves for the jobs of the future will all be explored in over 350 sessions, nearly half of which will be broadcast on our website. Here's a selection of Agenda articles to help you prepare for the week ahead. "After World War II, the international community came together to build a shared future. 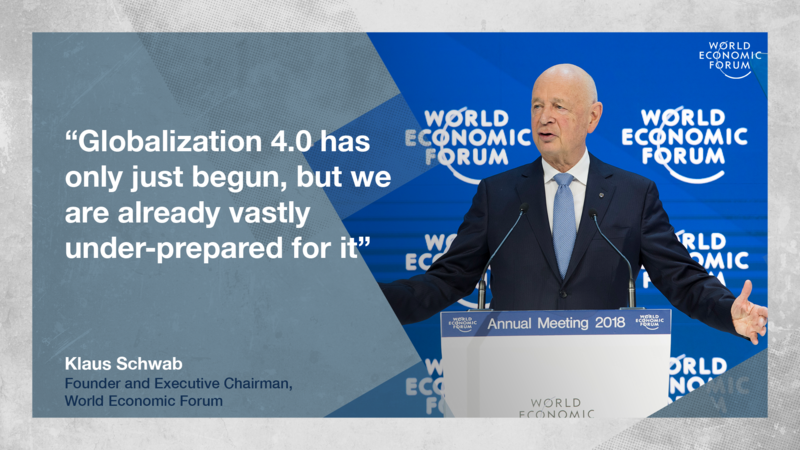 Now, it must do so again," writes Professor Klaus Schwab, the founder and executive chairman of the World Economic Forum, in this article on the meaning of Globalization 4.0. And this is Globalization 4.0 - what were the other three? When did globalization start? What were its major phases? From Silk Roads and Spice Routes to the Age of Discovery and the World Wars, here's a brief history. If we're witnessing a new wave of globalization, what does the world think about it? Polling firm Qualtrics surveyed more than 10,000 people in 29 countries and asked them questions about Globalization 4.0, including the impact of technology, the future of work, education, and social mobility. Here's a look at the main findings. Elsewhere, Forum President Børge Brende and the International Rescue Committee's David Miliband argue that Globalization 4.0 can be designed to make sure no one is left behind, while Oxfam International's Executive Director Winnie Byanyima says it can indeed work for everyone - if it breaks from the injustices of the past. What are the biggest risks to the global economy in 2019? We might see slow, steady global economic growth this year - but the reality is more likely to be nerve-wracking, writes Harvard's Kenneth Rogoff. Meanwhile, the Forum's Head of Centre for the New Economy and Society offers four ways we can fix economics in 2019, including getting proactive on job creation, while Nariman Behravesh, Chief Economist at IHS Markit, makes 10 predictions for the year ahead. In a more sideways look at the global economy, Arif Husain, a food economist at the UN World Food Programme, argues that access to nutrition is about more than counting calories, while Derek Fidler and Hicham Sabir from Sheltertech (a company that uses technology solutions to help fight homelessness) explore a lesser-known cause of income inequality in the US - home ownership. Of all the risks posing a threat to our common future, climate change is perhaps the most urgent. With environmental threats dominating this year's edition of the Global Risks Report, it's clear the world needs to act now to avert catastrophic climate change. Globalization 4.0 can help us limit global warming to less than 1.5°C, but "it will take an unprecedented level of collaboration and innovation, involving many outside the public sector," argues Forum founder Professor Klaus Schwab. Protecting our wild places, and the wildlife that lives in them, is vital, argue Enric Sala, National Geographic's Explorer-in-Residence and Dynamic Planet's CEO Kristin Rechberger, in this blog. "The oxygen we breathe, the water we drink, the food we eat - they all depend on other forms of life. Without the rest of species on the planet, there would be no prosperity, no economy, no us," they write. Elsewhere, we can turn the whole economy carbon neutral, writes Energy Transitions Commission chairman J. Adair Turner, while Norwegian Prime Minister Erna Solberg says the ocean holds the key to sustainable development. Finally, Cristiana Pasca Palmer, Executive Secretary of the Convention on Biological Diversity, explains why a healthy economy and a healthy planet go hand-in-hand. A whole new wave of change is crashing on us in the form of the high-tech digital revolution, with a wide range of impacts for all of us. It's time to get ready. Cities, for example, are investing in smart technologies to deal with rapid urbanization, including using AI to monitor crime patterns and even the weather to keep people safe. Cities failing to get smart now will quickly be left behind, argues Howard Elias of Dell. Talking of AI, it could revolutionize the world of clean energy - if we use it properly. And what about machines that can automatically detect when they need to be fixed? That's just around the corner, says Seimens' Klaus Helmrich. What does this mean for our jobs? The impact of Globalization 4.0, new technologies, climate change and other seismic shifts on the future of skills, education and employment will be huge. The next 20 years "promise a full-scale revolution in our working lives," argues Upwork CEO Stephane Kasriel, who believes that jobs will become more accessible, more flexible and more liberating in the age of the robots. "As businesses adopt new technologies many of today’s jobs will cease to exist, and many new ones will appear," the economist and author Rutger Bregman told the Forum in this interview. But instead of fearing the possible outcomes, we need to seize this chance to "completely redefine the meaning of work – and in doing so make a big difference to society," he goes on to say. What does the world's best teacher think? 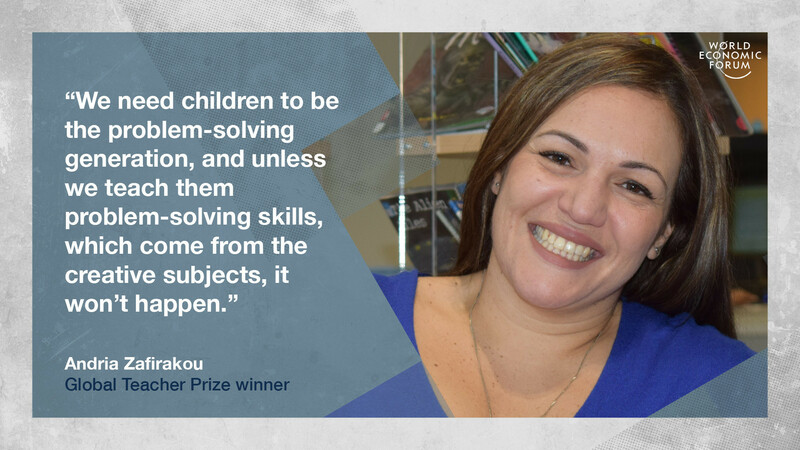 Andria Zafirakou, the 2018 winner of the Global Teacher Prize, also spoke to the Forum ahead of Davos 2019. Globalization 4.0 is also an opportunity to re-asses how we define "normal", says Susannah Rodgers, a Paralympian and Director of Spirit of 2012. "In the First Industrial Revolution ... the idea of being "normal" excluded the less physically “able” worker," she writes. The Fourth Industrial Revolution, on the other hand, offers us a chance to be truly inclusive. Find out more about the big ideas behind our Annual Meeting in this collection of articles by and about Davos 2019 participants.